In any field of inquiry, the most interesting aspect is always thresholds. Interfaces between two systems. To an ecologist, mountains are interesting for their alpine forests and vertically oriented fauna. Plains are interesting for their grasses and swamps. But nothing is as fascinating as the foothills, where two ecosystems meet. One of the most interesting (and useful) fields today is that of “human interface”—the place where people and their machines meet. And then there is the study of chaoplexity—the fascinating border between rigid order and total randomness, where things such as amoebas, bond traders, Chabad House rabbis and the like occur. In halachah (Torah law), there is much discussion on the status of twilight—the gray area between when day stops and night begins. A gateway is one of the most common metaphors of Torah: a place where you are neither in nor out, but part of both. Torah generally talks in terms of dual systems: heaven and earth; G‑d and man; creator and created; nothingness and something. So if we want to get into fascinating territory, we can ask: Where do they meet, and what happens there? The chamber of the Holy of Holies measured twenty cubits by twenty cubits. The ark was placed in the center, measuring two and a half by one and a half cubits. From the southern wall of the chamber to the adjacent side of the ark measured ten cubits. The same measurement was taken on the north side of the chamber. You’re reading correctly: The ark took up no space. Or, to be more precise, from the frame of reference of the dimensions of the chamber, the ark occupied no space. 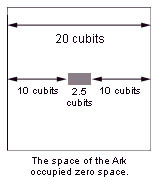 The ark itself had to take up two and a half by one and a half cubits, because those are the dimensions specified for it by the Torah in order to be an ark that can go in this chamber and not take up space. Jacob found himself in a place that expresses the essence of Torah. He found himself between two expressions of the one G‑d: Havayeh and Elokim. Pantheism and idolatry arose by separating these two manifestations of the same G‑d. All people recognize that there are forces of nature. Some are smart enough to realize the unity of all these forces from observing how they harmonize together and are expressed in similar patterns. The ancients created from this understanding a sophisticated pantheon of divine beings. The more enlightened amongst them thought of these idols as mere reflections of the forces of nature. Yet, to this day, most people still accept these forces as being absolute and necessary. A world without gravity or electromagnetic waves is almost as unthinkable as a world without TV. Never mind the absence of time, space and logic themselves. G‑d as the force behind all natural forces is expressed by the name Elokim. When the Torah discusses the creation of the world by ten sayings, it uses this name, as in “Elokim said, ‘It should be light’—and there was light.” So this is G‑d expressed within time and space and all that we can observe. G‑d as He is immanent. But at the essence of everything is something that is beyond all of them. Something that cannot be defined as the perfection of them, nor as the absence of them. Something that cannot be defined at all. Havayeh is G‑d as He is beyond all that can be known. Transcendent. “I am Havayeh, I have not changed.” Beyond time and space and any reasoning we could apply. The very source of all being. As Maimonides writes, “If He is, then all else is. But if He is not, then nothing else can be.” Miracles, Torah and tzaddikim are manifestations of Havayeh in the world. Interestingly, the ancient pantheons, from Egypt to Norway, generally included an original god from whom all things began. But that godhead remained entirely aloof from the whole hierarchy. After all, getting involved in the petty world that arose from his essential being would contaminate his perfect oneness. And so Pharaoh said to Moses, “Who is Havayeh that I should listen to His voice?” Pharaoh didn’t deny the existence of such a being, just the idea that He would care to mix into Egypt’s internal politics. Returning to the space of the ark that took up no space, you may ask: How could space remain in the midst of a revelation of non-space? Space is a limitation. When all limitations are blasted away by a revelation of Havayeh, space should altogether disappear. Expecting otherwise is like expecting the shadows to remain when all the lights are turned on. An easy answer is, “It’s a miracle. G‑d can do anything.” However, that’s a last-resort answer. First we need to see if there’s something we can sink our teeth into, before declaring it out of our bounds. One way out is to ask, “Perhaps our understanding of space is not what space really is?” By acknowledging that there could be non-space, we have already cast away the impression that space is an absolute given, something that just is and must be. The same G‑d who created a world bound by time and space could have come up with something else altogether—although we creatures of time and space would be hard put to imagine such a thing. But we could go even further: Is space a static thing? Or is it an event which is continually being renewed out of the void? If we choose the second option, we can then see space itself as just another expression of that which is beyond space. The One G‑d expresses Himself as non-space and as space—but He is neither. And the very fact that the two can coexist is a demonstration of this idea: that He is neither of them, but rather that which is beyond both. This is the connection between this space and the third of the forefathers: Although the world is generally a binary place, there is a third factor, that which binds and unites all opposites together—even space and non-space. And that, too, is the revelation exemplified by the Third Temple, may it be built very soon, sooner than we can imagine. Based on “Gadol Yihyeh 5722,” a discourse by the Lubavitcher Rebbe. What Was the Holy Temple? Seeking the Lost Mountain of Sinai? Response to TZ Freeman One wouldn't think so but they're certainly making up for it now. *The Vatican Wants the Temple Mount IsraelNational News. Tzv Freeman respnse. I have a great library and try to keep up with Jewish current affairs, agendas of others and their powers of persuasion. Investigative journalist Joel Bainerman in particular, [R.I.P.] was one author who had a great insight and I went searching for his works after reading a couple of recent articles in Arutz Sheva last week, *In Honour of Tisha B'Av: Palestinians Say Holy Temple was Roman 24th July and *Thousands "March" for Sovereignty in Jerusalem 26th July. Pronunciation of YHWH You said: “Y‑H‑V‑H (we pronounce that ‘Havayeh,’ as the Torah instructs us not to pronounce the four-letter name of G‑d the way it is written; more about this name later)"
Where can I find more information about this? Awesome, as always! As always, another excellent piece of writing by Rabbi Freeman! As a gentile who has long been interested in different man-made religions, it amazes me how well the Torah is able to respond to all the questions of every type of people - however they may think and whatever their culture may be. This establishment of duality vs. non-duality as fact simply blows Hindu/Buddhist concepts of this issue out of the water! The Holy Temple This is truly awesome!!!!!!! Bethel The Sages do have a tradition for saying that Har HaBayit, Har HaMoriah and Bethel are the same place. There are several other names for Har HaBayit, as there are for many other parts of Israel as well. the mount I thought this was intresting, but I thought Jacob had this dream at Bethel, not Har Habayit? At the Threshold Beautiful, simply beautiful.